My omelet recipes are requested all the time. I include several recipes and filling ideas that you can use, including my baked omelet. You can cook the hash browns or the remaining items of your breakfast when it's baking. More easy breakfast recipes above and at the end of the page. Here's one of my favorite omelet recipes that is a snap to make and tastes wonderful. This recipe is just a guide, and there is no end to the ingredients you add to it. Feta and spinach, ham and swiss, sausage, seafood, etc. If you don't have sour cream, just use 1 cup of milk total instead. PREHEAT oven to 350 degrees and grease a glass 8x8 casserole dish with some of the leftover bacon grease. Fry bacon, drain and crumble. Beat the first eight ingredients together in a mixing bowl. Add the bacon. Pour into the prepared baking dish and bake for 45 minutes to 1 hour. During the last five to ten minutes sprinkle the top with cheese. Serve with salsa or pico de gallo, sour cream, onions, peppers, black olives, etc. It's up to you. If you want to make two or three individual baked omelets, just spray 8 inch cake pans or baking dishes (equivalent), and bake all of them at the same time. Want to make more? Just double the recipe. Whisk the eggs with the cream, baking powder, garlic and onion powder, salt and pepper. Heat an 8-inch skillet over medium heat; add the butter and swirl to coat the entire bottom of the pan. Pour the whisked eggs into the skillet; let set slightly. Using a heat-proof spatula, push eggs from edge towards the center; tilt pan to let egg fill the spaces. Repeat until omelet if JUST set (about 1-2 minutes). Sprinkle the grated cheese down the center of the omelet. Using the same spatula, gently fold the omelet over the cheese. Tilt skillet and slide the filled omelet onto a serving plate. 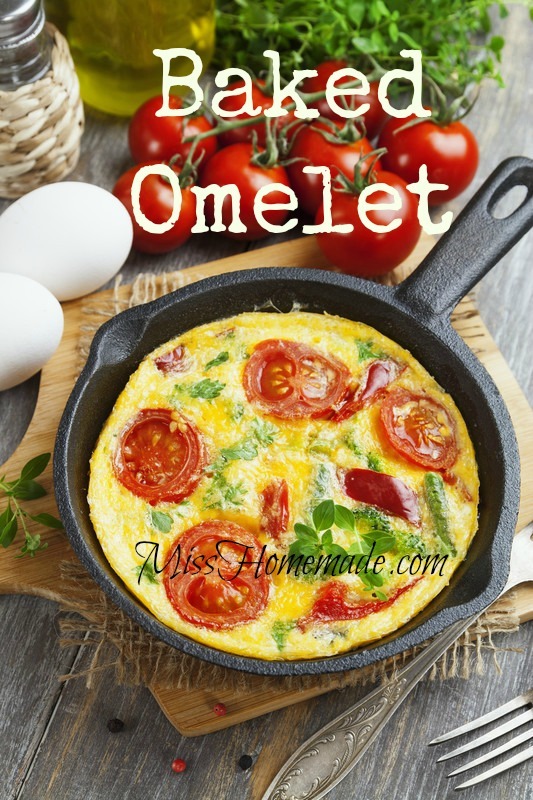 I have more omelet recipes (filling ideas) further down the page. Instead of giving you omelet recipes, I thought the filling list would be a great start to an awesome omelet. Cheese - pepper jack and cheddar cheese. Cheese steak...a chopped up Steak-um, sauteed onions, some mozzarella cheese and a little tomato sauce on the side. Add sauteed green peppers for a Philadelphia cheese steak omelet. Italian sausage and sauteed green peppers and onions. Turkey and dressing with gravy on top - cranberries on the side. Spinach, feta and a bit of mozzarella cheese. Take eggs, add a touch of cream, cinnamon, and sugar. Then for the filling use berries mixed with a "sauce" made of pureed berries (in the blender) sugar and lemon juice. Then add dollops of sweetened sour cream on top or whipped cream. Stir extra-sharp cheddar into the eggs and then fill the omelet with a little smoky chipotle pepper salsa. Also: beat softened cream cheese into the eggs, saute a little onion in butter, add the cream cheese and egg mixture & cook and then fill with cheddar cheese. Beat all together in a blender and cook 1/4 cup of mixture in a non-stick skillet as you would any crepe. Makes about 4 crepes and fill them with your favorite toppings. With the crepes above, you can fill them with shredded Monterey Jack cheese, cover them with enchilada sauce and heat them in the microwave until the cheese is melted and serve with sour cream and avocado slices. Pizza Omelet - Fill with green peppers, mushrooms, pepperoni and mozzarella cheese, cover in warm pizza sauce and melt a little more cheese on top under the broiler.